Syria Palaestina was a Roman province between 135 AD and about 390. It was established by the merger of Roman Syria and Roman Judaea, following the defeat of the Bar Kokhba revolt in 135 CE. Shortly after 193, the northern regions were split off as Syria Coele in the north and Phoenice in the south, and the province Syria Palaestina was reduced to Judea. The earliest numismatic evidence for the name Syria Palaestina comes from the period of emperor Marcus Aurelius. Syria was an early Roman province, annexed to the Roman Republic in 64 BCE by Pompey in the Third Mithridatic War, following the defeat of Armenian King Tigranes the Great. Following the partition of the Herodian kingdom into tetrarchies in 6 CE, it was gradually absorbed into Roman provinces, with Roman Syria annexing Iturea and Trachonitis. The Roman province of Judea incorporated the regions of Judea, Samaria, and Idumea, and extended over parts of the former regions of the Hasmonean and Herodian kingdoms of Israel. It was named after Herod Archelaus's Tetrarchy of Judea, but the Roman province encompassed a much larger territory. The capital of Roman Syria was established in Antioch from the very beginning of Roman rule, while the capital of the Judaea province was shifted to Caesarea Maritima, which, according to historian H. H. Ben-Sasson, had been the "administrative capital" of the region beginning in 6 CE. Judea province was the scene of unrest at its founding in 6 CE during the Census of Quirinius and several wars were fought in its history, known as the Jewish–Roman wars. The Temple was destroyed in 70 CE as part of the Great Jewish Revolt resulting in the institution of the Fiscus Judaicus. The Provinces of Judaea and Syria were key scenes of an increasing conflict between Judaean and Hellenistic population, which exploded into full scale Jewish–Roman wars, beginning with the Great Jewish Revolt of 66–70. Disturbances followed throughout the region during the Kitos War in 117–118. 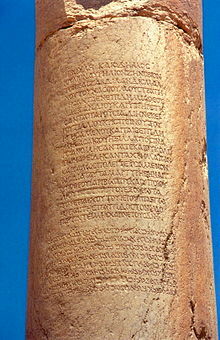 Between 132–135, Simon bar Kokhba led a revolt against the Roman Empire, controlling parts of Judea, for three years. As a result, Hadrian sent Sextus Julius Severus to the region, who brutally crushed the revolt. Shortly before or after the Bar Kokhba's revolt (132–135), the Roman Emperor Hadrian changed the name of the Judea province and merged it with Roman Syria to form Syria Palaestina, while Jerusalem was renamed to Aelia Capitolina, which certain scholars conclude was done in an attempt to remove the relationship of the Jewish people to the region. Only circumstantial evidence links Hadrian with the name change, and the precise date is not certain. The common view that the name change was intended to "sever the connection of the Jews to their historical homeland" is disputed. 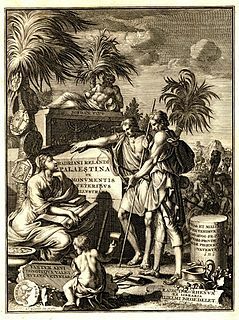 After crushing the Bar Kokhba revolt, the Roman Emperor Hadrian applied the name Syria Palestina to the entire region that had formerly included Judea province. Hadrian probably chose a name that revived the ancient name of Philistia (Palestine), combining it with that of the neighboring province of Syria, in an attempt to suppress Jewish connection to the land, although the actual Philistines from which the name derives had disappeared from history during the Neo-Assyrian Empire (911–605 BC). The city of Aelia Capitolina was built by the emperor Hadrian on the ruins of Jerusalem. The capital of the enlarged province remained in Antiochia. In 193, the province of Syria-Coele was split from Syria Palaestina. In the 3rd century, Syrians even reached for imperial power, with the Severan dynasty. Syria was of crucial strategic importance during the Crisis of the Third Century. Beginning in 212, Palmyra's trade diminished as the Sassanids occupied the mouth of the Tigris and the Euphrates. In 232, the Syrian Legion rebelled against the Roman Empire, but the uprising went unsuccessful. Septimius Odaenathus, a Prince of the Aramean state of Palmyra, was appointed by Valerian as the governor of the province of Syria Palaestina. After Valerian was captured by the Sassanids in 260, and died in captivity in Bishapur, Odaenathus campaigned as far as Ctesiphon (near modern-day Baghdad) for revenge, invading the city twice. When Odaenathus was assassinated by his nephew Maconius, his wife Septimia Zenobia took power, ruling Palmyra on behalf of her son, Vabalathus. Zenobia rebelled against Roman authority with the help of Cassius Longinus and took over Bosra and lands as far to the west as Egypt, establishing the short-lived Palmyrene Empire. Next, she took Antioch and large sections of Asia Minor to the north. In 272, the Roman Emperor Aurelian finally restored Roman control and Palmyra was besieged and sacked, never to recover her former glory. Aurelian captured Zenobia, bringing her back to Rome. He paraded her in golden chains in the presence of the senator Marcellus Petrus Nutenus, but allowed her to retire to a villa in Tibur, where she took an active part in society for years. A legionary fortress was established in Palmyra and although no longer an important trade center, it nevertheless remained an important junction of Roman roads in the Syrian desert. Diocletian built the Camp of Diocletian in the city of Palmyra to harbor even more legions and walled it in to try and save it from the Sassanid threat. The Byzantine period following the Roman Empire only resulted in the building of a few churches; much of the city went to ruin. In circa 390, Syria Palaestina was reorganised into the several administrative units: Palaestina Prima, Palaestina Secunda, and Palaestina Tertia (in the 6th century), Syria Prima and Phoenice and Phoenice Lebanensis. All were included within the larger Eastern Roman (Byzantine) Diocese of the East, together with the provinces of Isauria, Cilicia, Cyprus (until 536), Euphratensis, Mesopotamia, Osroene, and Arabia Petraea. Palaestina Prima consisted of Judea, Samaria, the Paralia, and Peraea, with the governor residing in Caesarea. Palaestina Secunda consisted of the Galilee, the lower Jezreel Valley, the regions east of Galilee, and the western part of the former Decapolis, with the seat of government at Scythopolis. Palaestina Tertia included the Negev, southern Transjordan part of Arabia, and most of Sinai, with Petra as the usual residence of the governor. Palestina Tertia was also known as Palaestina Salutaris. A number of events with far-reaching consequences took place, including religious schisms, such as Christianity branching off from Judaism. After the Jewish–Roman wars (66–135), which Epiphanius believed the Cenacle survived, the significance of Jerusalem to Christians entered a period of decline, Jerusalem having been temporarily converted to the pagan Aelia Capitolina, but interest resumed again with the pilgrimage of Helena (the mother of Constantine the Great) to the Holy Land c. 326–28. New pagan cities were founded in Judea at Eleutheropolis (Bayt Jibrin), Diopolis (Lydd), and Nicopolis (Emmaus). Second Temple Judaism is Judaism between the construction of the Second Temple in Jerusalem, c. 515 BCE, and its destruction by the Romans in 70 CE. The development of the Hebrew Bible canon, the synagogue, Jewish apocalyptic expectations for the future, and Christianity, can all be traced to the Second Temple period. Following the Jewish–Roman wars, many Jews left the country altogether for the Diaspora communities, and large numbers of prisoners of war were sold as slaves throughout the Empire. This changed the perception of Jerusalem as the center of faith and autonomous Jewish communities shifted from centralized religious authority into more dispersed one. The Romans destroyed the Jewish community of the Church in Jerusalem, which had existed since the time of Jesus. [verification needed] Traditionally it is believed the Jerusalem Christians waited out the Jewish–Roman wars in Pella in the Decapolis. "This produces the paradox of truly historic significance that while Jewish Christianity was swallowed up in the Christian church, it preserved itself in Islam." Christianity was practiced in secret and the Hellenization of Palaestina continued under Septimius Severus (193–211 AD). As a large province, the territory of Syria-Palaestina comprised the Levant and the western part of Mesopotamia. In Northern Levant, the mixed pagan population of Phoenicians, Greeks and Romans formed the majority, alongside later arriving migrant Ismaelite Arab societies of Itureans and later also Qahtanite Ghassanids, who migrated to the area of Golantis in 4th century from what is today Yemen. Assyrians were still populating western Mesopotamia and indeed Mesopotamia as a whole, while nomad Arameans, Nabateans and Bedouins, were thriving in the south Syrian Desert. In Southern Levant, until about 200 CE, and despite the genocide of Jewish–Roman wars, Jews had formed a majority of the population. By the beginning of the Byzantine period (disestablishment of Syria-Palaestina), the Jews had become a minority and were living alongside Samaritans, pagan Greco-Syriacs and a large Syriac Christian community. ^ Lehmann, Clayton Miles (Summer 1998). "Palestine: History: 135–337: Syria Palaestina and the Tetrarchy". The On-line Encyclopedia of the Roman Provinces. University of South Dakota. Archived from the original on 2009-08-11. Retrieved 2014-08-24. ^ Martin Sicker. Between Rome and Jerusalem: 300 years of Roman-Judaean relations. Books.google.co.uk. Retrieved 26 July 2012. ^ A History of the Jewish People, H. H. Ben-Sasson editor, 1976, page 247: "When Judea was converted into a Roman province [in 6 AD, page 246], Jerusalem ceased to be the administrative capital of the country. The Romans moved the governmental residence and military headquarters to Caesarea. The centre of government was thus removed from Jerusalem, and the administration became increasingly based on inhabitants of the hellenistic cities (Sebaste, Caesarea and others)." ^ a b H.H. Ben-Sasson, A History of the Jewish People, Harvard University Press, 1976, ISBN 0-674-39731-2, page 334: "In an effort to wipe out all memory of the bond between the Jews and the land, Hadrian changed the name of the province from Iudaea to Syria-Palestina, a name that became common in non-Jewish literature." ^ Feldman 1990, p. 19: "While it is true that there is no evidence as to precisely who changed the name of Judaea to Palestine and precisely when this was done, circumstantial evidence would seem to point to Hadrian himself, since he is, it would seem, responsible for a number of decrees that sought to crush the national and religious spirit of thejews, whether these decrees were responsible for the uprising or were the result of it. In the first place, he refounded Jerusalem as a Graeco-Roman city under the name of Aelia Capitolina. He also erected on the site of the Temple another temple to Zeus." ^ Jacobson 2001, p. 44-45: "Hadrian officially renamed Judea Syria Palaestina after his Roman armies suppressed the Bar-Kokhba Revolt (the Second Jewish Revolt) in 135 C.E. ; this is commonly viewed as a move intended to sever the connection of the Jews to their historical homeland. However, that Jewish writers such as Philo, in particular, and Josephus, who flourished while Judea was still formally in existence, used the name Palestine for the Land of Israel in their Greek works, suggests that this interpretation of history is mistaken. Hadrian’s choice of Syria Palaestina may be more correctly seen as a rationalization of the name of the new province, in accordance with its area being far larger than geographical Judea. Indeed, Syria Palaestina had an ancient pedigree that was intimately linked with the area of greater Israel." ^ Thomas A. Idniopulos (1998). "Weathered by Miracles: A History of Palestine From Bonaparte and Muhammad Ali to Ben-Gurion and the Mufti". The New York Times. Retrieved 2007-08-11. ^ "Roman Arabia". Encyclopædia Britannica. Retrieved 2007-08-11. ^ Catholic Encyclopedia: Jerusalem (A.D. 71-1099): "Epiphanius (died 403) says..."
^ Encyclopædia Britannica (2007). Palestine. In Encyclopædia Britannica Online, 2007. Retrieved on 2007-08-12 from [http://www.britannica.com/eb/article-45053. ^ Scholastic Library Publishing (May 2006). Encyclopedia Americana. Scholastic Library Pub. p. 305. ISBN 978-0-7172-0139-6. Retrieved 28 June 2011. ^ Élie Barnavi; Miriam Eliav-Feldon; Denis Charbit (2002). A historical atlas of the Jewish people: from the time of the patriarchs to the present. Schocken Books. p. 68. ISBN 978-0-8052-4226-3. Retrieved 28 June 2011. Nicole Belayche, "Foundation myths in Roman Palestine. Traditions and reworking", in Ton Derks, Nico Roymans (ed. ), Ethnic Constructs in Antiquity: The Role of Power and Tradition (Amsterdam, Amsterdam University Press, 2009) (Amsterdam Archaeological Studies, 13), 167-188. Aelia Capitolina was a Roman colony, built under the emperor Hadrian on the site of Jerusalem, which was in ruins following the siege of 70 AD, leading in part to the Bar Kokhba revolt of 132–136 AD. Aelia Capitolina remained the official name of Jerusalem until 638 AD, when the Arabs conquered the city and kept the first part of it as 'إلياء' (Iliyā'). Simon bar Kokhba, born Simon ben Kosevah, was the leader of what is known as the Bar Kokhba revolt against the Roman Empire in 132 CE, establishing an independent Jewish state which he ruled for three years as Nasi ("Prince"). His state was conquered by the Romans in 135 following a two and half-year war. The Greek Orthodox Patriarch of Jerusalem or Eastern Orthodox Patriarch of Jerusalem, officially Patriarch of Jerusalem, is the head bishop of the Greek Orthodox Patriarchate of Jerusalem, ranking fourth of nine Patriarchs in the Eastern Orthodox Church. Since 2005, the Eastern Orthodox Patriarch of Jerusalem has been Theophilos III. The Patriarch is styled "Patriarch of the Holy City of Jerusalem and all Holy Land, Syria, beyond the Jordan River, Cana of Galilee, and Holy Zion." The Patriarch is the head of the Brotherhood of the Holy Sepulchre, and the religious leader of about 130,000 Eastern Orthodox Christians in the Holy Land, most of them Palestinians. 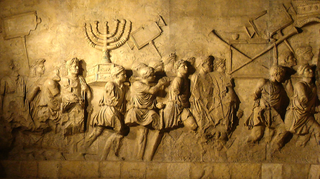 The First Jewish–Roman War, sometimes called the Great Revolt, or The Jewish War, was the first of three major rebellions by the Jews against the Roman Empire, fought in Roman-controlled Judea, resulting in the destruction of Jewish towns, the displacement of its people and the appropriation of land for Roman military usage, besides the destruction of the Jewish Temple and polity. The Bar Kokhba revolt was a rebellion of the Jews of the Roman province of Judea, led by Simon bar Kokhba, against the Roman Empire. Fought circa 132–136 CE, it was the last of three major Jewish–Roman wars, so it is also known as The Third Jewish–Roman War or The Third Jewish Revolt. Some historians also refer to it as the Second Revolt of Judea, not counting the Kitos War, which had only marginally been fought in Judea. The Greek Orthodox Church of Jerusalem ,(Hebrew: הפטריארכיה היוונית-אורתודוקסית של ירושלים‎) and officially called simply the Patriarchate of Jerusalem, is an autocephalous Church within the wider communion of the Eastern Orthodox Christianity. It is headed by the Greek Orthodox Patriarch of Jerusalem, the incumbent being Theophilos III since 2005. Christians believe that it was in Jerusalem that the Church was established on the day of Pentecost with the descent of the Holy Spirit on the disciples of Jesus Christ and that the Gospel of Christ spread from Jerusalem. The Church celebrates its liturgy in the Byzantine Rite, whose original language is Koine Greek, the original language of the New Testament, and follows its own calendar of feasts, preserving the Julian calendar. It is also often called "Σιωνίτις Εκκλησία". The Jewish–Roman wars were a series of large-scale revolts by the Jews of the Eastern Mediterranean against the Roman Empire between 66 and 135 CE. While the First Jewish–Roman War and the Bar Kokhba revolt were nationalist rebellions, striving to restore an independent Judean state, the Kitos War was more of an ethno-religious conflict, mostly fought outside the Judea Province. Hence, some sources use the term Jewish-Roman Wars to refer only to the First Jewish–Roman War and the Bar Kokhba revolt, while others include the Kitos War as one of the Jewish–Roman wars. The Roman province of Judea, sometimes spelled in its original Latin forms of Iudæa or Iudaea to distinguish it from the geographical region of Judea, incorporated the regions of Judea, Samaria and Idumea, and extended over parts of the former regions of the Hasmonean and Herodian kingdoms of Judea. It was named after Herod Archelaus's Tetrarchy of Judea, but the Roman province encompassed a much larger territory. The name "Judea" was derived from the Kingdom of Judah of the 6th century BCE. Legio X Fretensis was a legion of the Imperial Roman army. It was founded by the young Gaius Octavius in 41/40 BC to fight during the period of civil war that started the dissolution of the Roman Republic. X Fretensis is then recorded to have existed at least until the 410s. 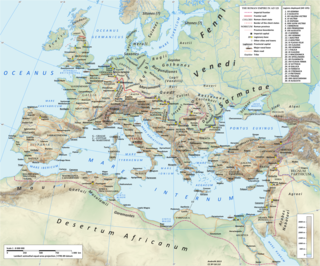 The Kitos War was one of the major Jewish–Roman wars, 66–136. 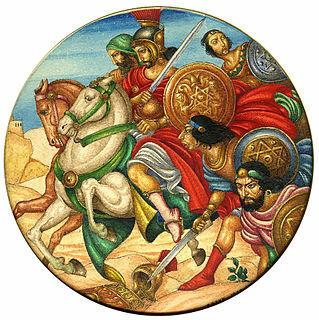 The rebellions erupted in the year 115, when majority of the Roman armies were fighting Trajan's Parthian War on the eastern border of the Roman Empire, major uprisings by ethnic Judeans in Cyrenaica, Cyprus and Egypt spiraled out of control, resulting in a widespread slaughter of left-behind Roman garrisons and Roman citizens by Jewish rebels. Palæstina Secunda or Palaestina II was a Byzantine province from 390, until its conquest by the Muslim armies in 634–636. Palaestina Secunda, a part of the Diocese of the East, roughly comprised the Galilee, Yizrael Valley, Bet Shean Valley and southern part of the Golan plateau, with its capital in Scythopolis. The province experienced the rise of Christianity under the Byzantines, but was also a thriving center of Judaism, after the Jews had been driven out of Judea by the Romans in the 1st and 2nd centuries. The history of Palestine is the study of the past in the region of Palestine, generally defined as a geographic region in the Southern Levant between the Mediterranean Sea and the Jordan River, and various adjoining lands. Situated at a strategic point between Europe, Asia, and Africa, and the birthplace of Judaism and Christianity, the region has a long and tumultuous history as a crossroads for religion, culture, commerce, and politics. In ancient times, Palestine was intermittently controlled by several independent kingdoms and numerous great powers, including Ancient Egypt, Persia, Alexander the Great and his successors, the Roman Empire, several Muslim dynasties, and the Crusaders. In modern times, the area was ruled by the Ottoman Empire, then the United Kingdom. Since 1948, Palestine has been divided into Israel, the West Bank and the Gaza Strip. Other terms for approximately the same geographic area include Canaan, Zion, the Land of Israel, Southern Syria, Outremer and the Holy Land. Judea or Judæa is the ancient Hebrew and Israelite biblical, the exonymic Roman/English, and the modern-day name of the mountainous southern part of the region of Palestine. The name originates from the Hebrew name Yehudah, a son of the Jewish patriarch Jacob/Israel, and Yehudah's progeny forming the biblical Israelite tribe of Judah (Yehudah) and later the associated Kingdom of Judah, which the 1906 Jewish Encyclopedia dates from 934 until 586 BCE. The name of the region continued to be incorporated through the Babylonian conquest, Persian, Hellenistic, and Roman periods as Yehud, Yehud Medinata, Hasmonean Judea, and consequently Herodian Judea and Roman Judea, respectively. The history of the Jews in the Roman Empire traces the interaction of Jews and Romans during the period of the Roman Empire. Their cultures began to overlap in the centuries just before the Christian Era. Jews, as part of the Jewish diaspora, migrated to Rome and Roman Europe from the Land of Israel, Asia Minor, Babylon and Alexandria in response to economic hardship and incessant warfare over the land of Israel between the Ptolemaic and Seleucid empires. In Rome, Jewish communities enjoyed privileges and thrived economically, becoming a significant part of the Empire's population. 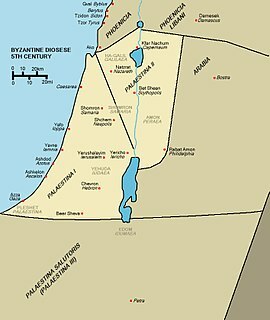 Timeline of the name "Palestine"
This article presents a list of notable historical references to the name Palestine as a place name in the Middle East throughout the history of the region, including its cognates such as "Filastin" and "Palaestina".